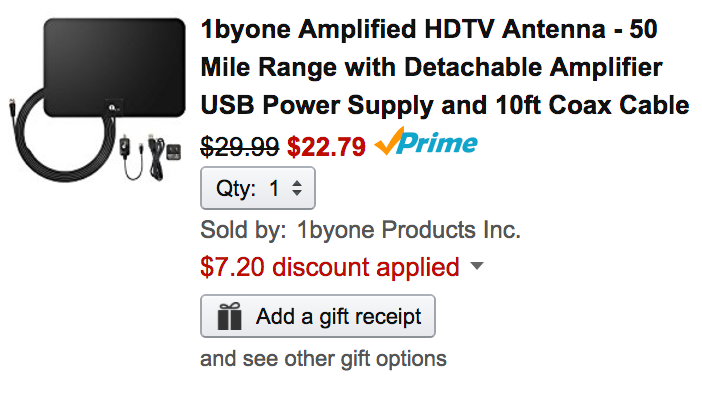 1byone Products Inc. (98% positive feedback from over 54,000) via Amazon is offering its amplified HDTV 50-mile range antenna for $29.99, but if you use the coupon code SS38X7QO the price will drop to just $22.79 Prime shipped. That’s $7.20 off the regular price and the lowest we can find for it. “This isn’t just an antenna – it’s a passport to freedom.” The 1byone antenna lets you receive all of your local news, weather, sitcoms, kids and sports programs for free. Just connect it to your television and let it go to work! It comes with a detachable amplifier, USB power supply and 10ft coax cable to get you started. Rated 3.9/5 stars by over 12,000 Amazon shoppers and its the #1 best seller in its category. You can use this tool to check for local channels. 1byone Paper Thin Digital Indoor HDTV Antenna is specially designed for receiving digital over-the-air (OTA) TV broadcasts from local television stations and can pull in all of your local news, weather, sitcom, kids and sports programming with no monthly contract or bills. Just plug it in to your television and let the antenna do all the work.